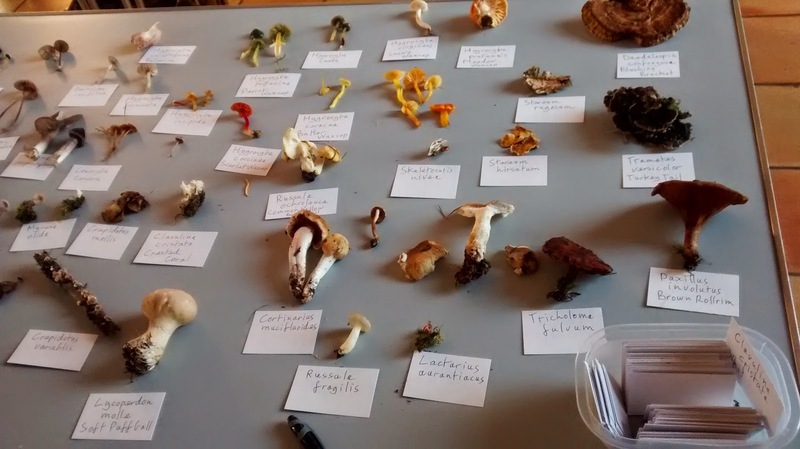 A couple of weekends ago I signed up to go on a fungi foraging trip with the foraging expert from River Cottage. I love fungi anyway - one of my obsessions is taking photographs of the stuff. Plus mushrooms are tasty and foraging for free food interests me. 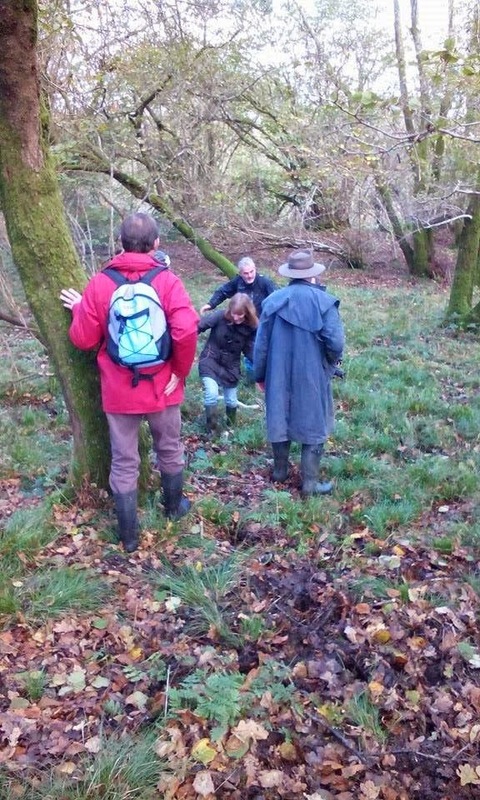 So we all met up at Kingcombe in Dorset and headed out into the countryside.Our guide, John Wright, would stop to show us interesting fungi and tell us all about it - how to identify things and whether or not it was edible. 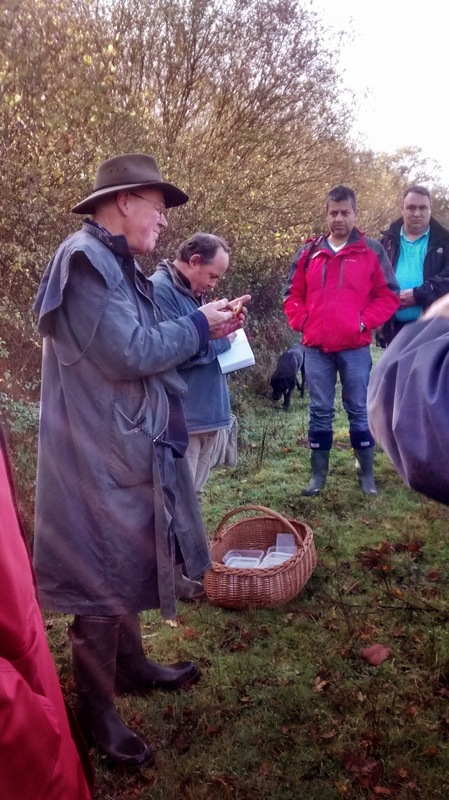 This is him on the right telling us about, I think, honey fungus. I have a friend who is a gardener who'll tell me how evil honey fungus is so I was already familiar with that particular one! It kills trees, so not good. And I think it's quite hard to get rid of. It was quite cold out - no rain but lots of mud so we all had our wellies on. We wandered all over the place looking for fungi and putting specimens in our baskets. Then we came to a really boggy area and was warned that we might get stuck so to be careful. I headed off and took a few photographs of various fungi - bracket fungi and a couple of others that I can't actually remember the name of. I decided not to follow my friend as the way she was heading looked really boggy, so I set off on my own. Big mistake. It wasn't long before I was stuck fast and sinking. There was bog inside one of my wellies and I could not get out. Luckily, another member of the group spotted me and called for help. The photo on the left is one my friend took (she was too busy laughing and taking the photo to help!) of John Wright and several others hauling me out of the bog. Once rescued, I spent the rest of the day wandering around with a squelchy, boggy welly! Oh, and shortly after this, I then fell in a badger set and had to be pulled out of that, too. But, once we got back to the centre, there was yummy tea and lots of cake and goodies waiting for us. So I sat and filled my face and changed out of my wellies. An informative and fun day.